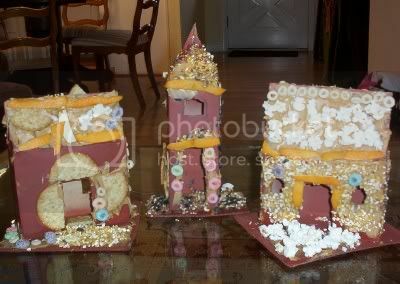 Here are three of the finished products...made by three-year-olds. So much for perfection! Today the neighborhood moms are coming by for an afternoon of holiday kid crafts. I've been waiting for the main project for ages--or at least until Andrew outgrew the age of eating the birdseed or tossing in the air like confetti. I saw a catalog gingerbread bird kit for $50; directions said to spread it with peanut butter for "icing". The traditional milk cartons are free, though I did spray them brown to cover the logo. I've also cut a variety of cardboard gingerbread people for simpler, 1-dimensional decorating. Each child gets a 6-cup muffin tin filled with striped sunflower seeds, corn kernals, black thistle seed, a generic small bird mix, fruit loops, and cranberries. Our salvage grocer sells repackaged seed from burst bags very economically. Supplies cost less than $5, with plenty of seed for our own birds this winter.